The Vestil MDS-96-SM Outdoor Smoking Shelter is designed to stand up to all weather conditions. The 18 gauge steel roof is contoured to allow water to drain off. Roof will hold snow weight of 45lbs./SqFt. Shelter features a clear front wind blocking panel measuring 42" wide to offer protection from wind and weather. Smoking shelter also includes a wooden lean-back bench rail for added user comfort. Lag down plates are included for securing shelter to concrete. The MDS-96-SM ships knocked down, simple assembly is required. 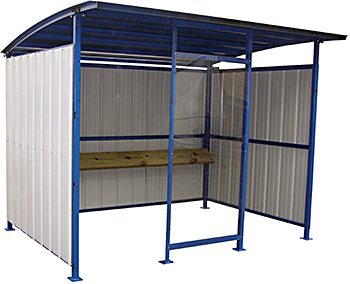 The MDS-96-SM Smoking Shelter is built to order with a normal lead time to leave the warehouse of 5 to 6 business days.